As mentioned in the previous post, we’re starting to look more closely into the various educational approaches that exist in the world. As such I will present an overview of a particular approach and discuss its advantages and disadvantages in terms of it being applicable for creating an education system that facilitates change towards a world that is best for all. In this post we are going to look further into the Reggio Emilia approach. The Reggio Emilia approach was created after World War 2 in a rural community in Northern Italy after the area was completely destroyed. The people faced grim poverty and high unemployment and a group of activists decided to restructure the school system with the specific purpose of restructuring the community itself. This background of the Reggio Emilia approach is important – because it shows how we as humans seem to only be willing or able to move and restructure our societies when we’re at brink of despair and destruction. Only when we have nothing to lose, do we seem to be able to look at new ways of living together. So the Reggio Emilia approach was born out of despair. And a particular aspect of the background for the approach has to be seen in the wake of World War 2 in Europe and fascism in Italy in particular. Because something that the approach specifically focused on was the right and might of children to have a voice of their own. There was a longing to provide children with the kind of lives that the adults themselves would have wanted to grow in. This in itself is significant – because it might give some clue to why the Reggio Emilia approach has become so popular in our current western societies in Europe and in the U.S.
Because in some ways the approach is based on the principle of doing onto another as you would want done onto you – the principle taught to us by Jesus – a principle that is often preached and seldom lived, but here it is put into practice. The activists looked at how to restart society in a wholesome and peaceful way, where children wouldn’t be encouraged to grow up and become fascists or nazists and nor the victims of such, but to co-exist in a way that was best for all in the community. 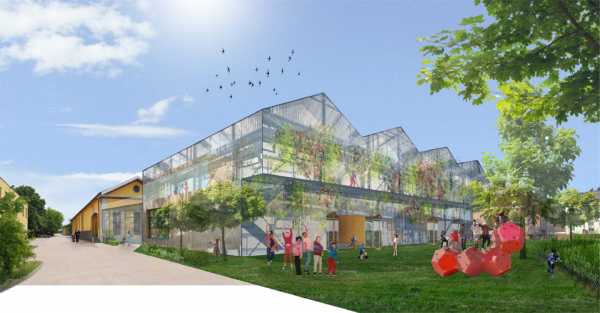 School was seen as a symbol for change and a primary function the new Reggio Emilia schools were to serve was to not only educate the children but also the parents and the larger community. As such the schools also provided jobs for women and involved parents actively in the development of the school. Now – let’s look at some of the basic principles in the Reggio Emilia approach. I will firstly introduce each principle and then I will provide a reflected perspective on that. 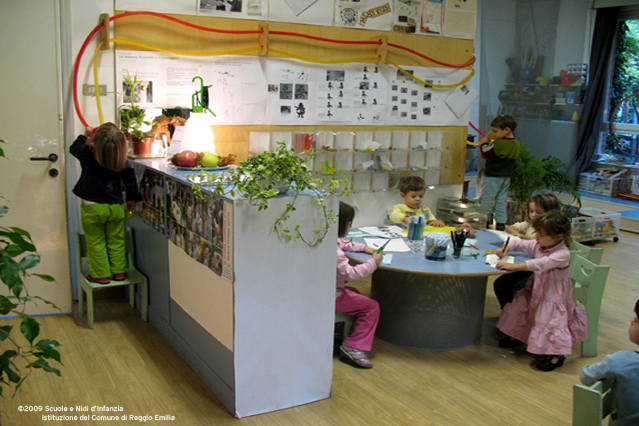 In the Reggio Emilia schools (or those inspired thereof) the environment itself is seen as a teacher. Therefore a great focus in the schools is the way the rooms and surroundings are created. In some schools there is spared no expense and the school I mentioned in my previous post, for example resembles more a caste than a school. All the walls are packed with the children’s art and everywhere there are science projects and paints available for the children to grab and use. Nothing is locked away. 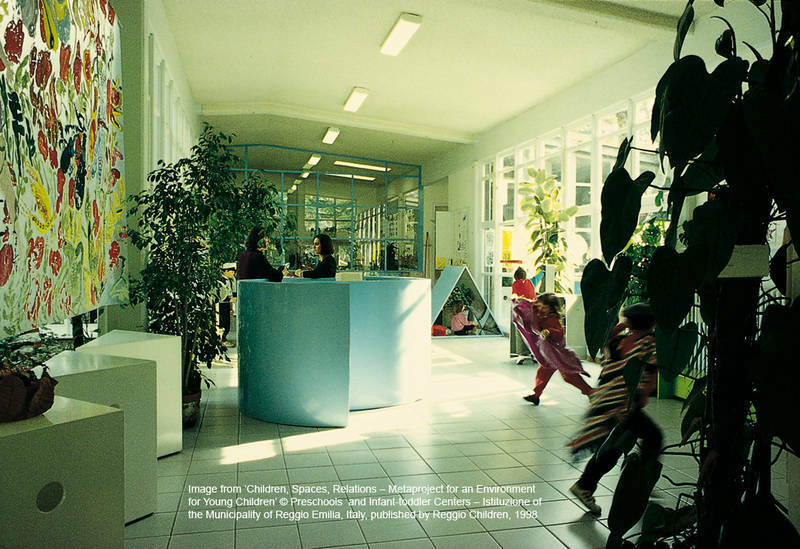 Another example of Reggio Emilia’s emphasis of the environment as a teaching facilitator is that the schools are created to resemble more a home or a living environment – and thus not, as on many other schools, an institution that more resembles a church or a hospital (or some would say: a prison). There are couches and comfortable chairs, all the children has their own place for their jackets and shoes and books and most noteworthy, there’s often a mess of colors and crayons everywhere, not unlike most children’s rooms at home. Now – let’s have a look at the advantages and disadvantages of this approach. First of all, it is obvious that space is educational. In other words: the way our societies and cities are structured affects how we live and interact as well as how we see the world. Did you for example consider how straight streets with tall houses affect how you walk around a city? Or how a classroom resembles a church with the teacher standing as a priest before a congregation? Similarly nature affects us and the rooms children are placed in to learn affect how and what they learn. This aspect of children’s education is often overlooked or not prioritized at all which can be seen in almost every school around the world. So the fact that space is considered within the Reggio Emilia approach is most advantageous. Because the educators are taking something that is often taken for granted and overlooked and questioning it, its purpose, function and value. And from there it become possible to also find out what kind of environment is the best for children to learn in. However at the same time, having all the walls plastered with art might not be the best for all children or in all circumstances and as such it can be argued that the Reggio Emilia approach, especially when it comes to art, favors a specific expression – an expression that might benefit a lot of kids but where others might get distracted who would have benefitted from a room with plain white walls. So this is something I would consider were I to create an educational environment that is best for all. Because ‘best for all’ doesn’t have to mean ‘the same’ – it is more ‘the same in value’ so that all children’s needs are carefully considered and cared for. Obviously this is not something that the current education system and supply: an environment where each child’s specific needs are taken into consideration. And as such, some form of uniformity is required because the schools budgets simply can’t handle providing a space that is actually best for all. And why is that? Schools are either private or public. The public schools often have small budgets because they have to compete with the defense budgets and the budgets for creating new tourist attractions to a society. In private schools they often depend on a small group of benefactors with a specific goal – a goal that is more focused on results than on processes. This is thus also a point where the Reggio Emilia approach to educational space can be criticized because it is predominantly wealthy people’s children in wealthy countries that attend Reggio Emilia schools. The demand for space and art supply and a rich environment is something most schools cannot afford nor provide. As such, in many countries, for example in the U.S the fees to attend Reggio schools are extremely high, which means that it is only the elite of the world who are able to benefit from this type of school environment. Within this we can ask what it is worth that a tiny proportion of the world’s population are educated to become ‘creative’, ‘independent’ individuals when rest of the world suffers, when millions of children can’t even go to school? Wouldn’t goal number 1 be to make sure that ALL CHILDREN have access to the kind of school environment that Reggio Emilia proposes? As such, the Reggio Emilia approach is cool – but only if it was actually applied at a global level. And as such, the way it exist now it is primarily a point of self-interest from parents who wants THEIR child to have the best possible education. But what is even more important is firstly that ALL children get education and then we can work together on finding out what type of educational environment that indeed is the best. I am sure Reggio Emilia’s approach to educational environment is a point worth considering when developing a new education system in an Equal Money System. Because in a way, the basic principle of Reggio Emilia is the same as the basic principle of Equal Money. We’re standing at the precipice between a decaying world system and a new system that we have yet to formulate – but we have the opportunity to start over and through education create the best possible community for all of us living together here on Earth. The space we live in – this world – our societies – this earth is not simply a backdrop or stage that we’re using as we go about our lives. We’re co-existing and are living inter-dependently with our environment. The environment is as alive as we are. It is about time we consider it as such. In the next post we will continue looking at the principles of the Reggio Emilia approach. If you’re interested in watching my videos on education, please check out my Youtube channel here.